Khajiit are cat-like people who come from Elsweyr, known for high intelligence and agility. These traits make them very good thieves and acrobats, but Khajiit are also fearsome warriors. However, they are rarely known to be mages. Khajiit mostly stay on land, but piracy and skooma trade does draw some to work as sailors. Khajiit anatomy differs greatly from both men and elves, not only because of their fur, tail, and sometimes toe-walking stance, but also their digestive system and metabolism. Khajiit, Argonians, and Imga are the so-called "beast races" of Tamriel because of these large differences. Khajiit have a lifespan similar to that of humans. There are no well-documented cases of cross-breeding between Khajiit and other races, though there are rumors of such a thing. 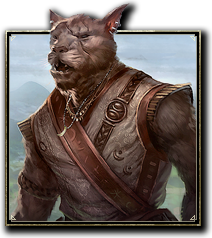 The foreign appearance and behavior of Khajiit make them common targets of racial discrimination. The racial skills of the feline Khajiit reflect their natural agility, giving them bonuses to pickpocketing, stealth, stamina recovery, and weapon damage. Cutpurse 1 ​ Increases your experience gain with the Medium Armor skill line by 15%. Increases your chance to successfully pickpocket by 5%. Robustness 5 Increases your Health Recovery by 33 and your Stamina and Magicka Recovery by 25. 15 Increases your Health Recovery by 66 and you Stamina and Magicka Recovery by 50. 30 Increases your Health Recovery by 100 and your Stamina and Magicka Recovery by 85. Lunar Blessings 10 Increase your Maximum Health, Magicka, and Stamina by 250. 20 Increase your Maximum Health, Magicka, and Stamina by 500. 40 Increase your Maximum Health, Magicka, and Stamina by 825. Feline Ambush 25 Increases your Critical Damage and Critical healing by 3%. Decreases your detection radius in Stealth by 1 meter. 35 Increases your Critical Damage and Critical healing by 6%. Decreases your detection radius in Stealth by 2 meters. 50 Increases your Critical Damage and Critical healing by 10%. Decreases your detection radius in Stealth by 3 meters. All Khajiit player characters are limited to the Suthay-raht sub-species upon release. Before release, it was suggested that more sub-species could be available later on. This page was last modified on 2 March 2019, at 22:40.